New Delhi, Aug 29 (IANS) Actor Ajay Devgn on Tuesday refuted claims that he walked out from the sets of “The Kapil Sharma Show” in anger, saying that he is not upset with Kapil Sharma and hasn’t taken a vow to never return to the show. There were talks that Ajay, who went to the show’s set to promote his forthcoming project “Baadshaho” recently, left from there as Kapil didn’t turn up for the shoot. Some reports said Kapil was partying till the wee hours, and wasn’t able to wake up on time to make it to the shoot. Ajay admitted that he left the sets because Kapil hadn’t arrived, but said he doesn’t know the reason behind the comedian’s absence from the shoot that day. 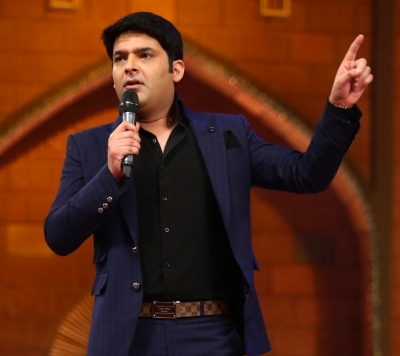 The actor said that Kapil has been dealing with health issues for quite some time now, but is not certain whether that was the reason behind his absence. During his promotional visit to the capital on Tuesday, Ajay cleared the air, and said that media is the reason behind most of the buzz around the story. Ajay asserted he didn’t leave the sets in anger. “We left because he hadn’t reached… When I will talk to him next, I will get to know the reason,” he said. On being questioned about his alleged vow to not return on the show, Ajay quipped that it is created by the media. Ajay also said he has no complaints. As far as holding a grudge is concerned, Ajay said he can’t answer whether he is angry or not as he doesn’t know the reason behind it. The actor was here with the whole cast of “Baadshaho” in connection with the promotion of the film which is slated to release on September 1.